With increased recognition that our voices count young women can, and already are, contributing to building a more inclusive and equitable society for all. I served as the U.S. delegate for the 9th annual G(irls)20 Global Summit that took place last month in Buenos Aires, Argentina. Launched in 2009 at the Clinton Global Initiative, Girls20 invests in young women through education, training, and leadership development. The G(irls)20 Summit, one of its signature programs, is modeled after the G20 Leaders’ Summit and brings together panelists and experts from around the world to discuss the economic and social issues faced by young women and girls. 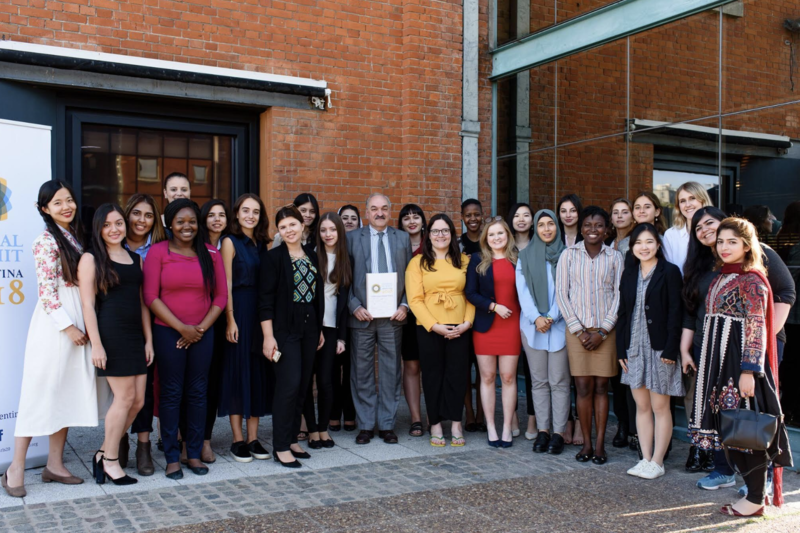 In total, 25 young women delegates were selected from across G20 countries and participating regions to represent their country or region at the Summit. I first learned of Girls20 when I was researching the Women 20 (W20) Summit, a G20 engagement group established under the Turkish presidency of the G20 in 2015 that works to support the promotion of gender-inclusive economic growth. I became curious about how the G20 engages with youth, particularly young women, on the relevant issues of education, the future of work, and gender equality. I applied to be this year’s U.S. delegate because I believed so strongly in Girls20’s mission to, “advance the full participation of girls and women globally through their economic and educational empowerment.” The G(irls)20 Summit is so important because it elevates the voices of young women, which was previously missing from the G20. We want G20 leaders to not only read our recommendations, but to take young women seriously as leaders and to agree upon policies that promote gender equality and reduce inequality gaps. The data still shows that women and girls around the world when compared to men experience greater inequalities resulting from multiple intersecting forms of inequality and as a result many are unable to reach their full potential. This means that the world continues to lose a vital source of talent, creativity, economic activity, and leaders for the future. Strengthening women’s decision-making power is necessary to achieve global gender equality, as women leaders are more likely to implement equitable policies that better serve communities and improve outcomes for current and future generations. The recommendations made by the G(irls)20 young women delegates show why women’s involvement in policy and decision-making are important, as we created recommendations that were grounded in our lived experiences and shared what we believed to be solutions to the barriers we face. For this next generation of young women leaders, we are very fortunate to be living in a time where our society is shifting from the narrative that women can only work in certain occupations or be effective in subordinate positions. In order to create real change in society, the G20 must listen to and authentically engage with young women. Elizabeth Zalanga is a student majoring in global studies with a minor in sustainability studies at the University of Minnesota-Twin Cities. She is passionate about social justice issues and actively serves on the Boards’ and Committees’ of several nonprofit organizations in the Minneapolis-Saint Paul area that work to reduce disparities faced by youth from traditionally underserved and underrepresented backgrounds. Elizabeth was recently named an Emerging City Champion by "8 80 Cities", a Women’s Foundation of Minnesota (WFMN) Innovator, is a United State of Women Ambassador (USOW), and served as a U.S. delegate to the 2018 Youth 20 (Y20) Summit and the G(irls)20 Summit in Argentina. I'm Excited AND Angry for Women Entering the Workforce. Here's Why.